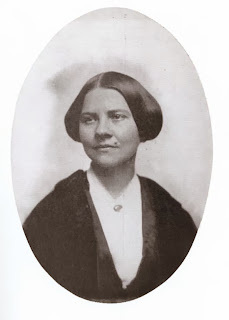 While considering how to convey the suspected reasoning behind Clara Barton’s nomination of Lucy Stone Blackwell, the best short phrase that keeps coming to mind is “The Original American Women’s Libber.” During my vetting process, one article on Stone-Blackwell states, “Stone was known for using her maiden name after marriage.” Unlike some of the other women ahead of their time in the 19th century, the choice did not seem to affect her marriage. Lucy Stone, like Barton, hailed from Central Massachusetts. Working through genealogical records found no biological kinship between Barton and Stone even though only a mere 19 miles separate their hometowns. Stone also, like Barton, grew up believing she could accomplish almost anything a man could and never understood why anyone considered women inferior to men. While Barton would go on to a career in humanitarianism, Stone would promote women’s suffrage. Barton and Stone also shared the teaching profession early in their adulthood that impacted their ideas about women’s rights. For Barton, teaching was somewhat a family occupation; both her sisters taught and her older brother Stephen superintended the Oxford, Massachusetts school system for a time. Stone also followed in her older siblings footsteps, and left the profession when paid less than her brother for substituting for him. Barton left when the public school committee in Bordentown, NJ hired a man as principal at the school she had organized and established. Neither would go back to the classroom as a teacher. Stone received her baccalaureate degree from Oberlin Collegiate Institute in Ohioon August 25, 1847, becoming the first female college graduate from Massachusetts. Influenced by abolitionist and women’s suffrage lecturers such William Lloyd Garrison, Sarah Grimke, and Antoinette Brown, Stone decided on a career as a public speaker. Surprisingly, the men in her family supported the idea, while Stone’s mother and sisters did not. Stone began giving anti-slavery lectures in Massachusetts, but by 1849 also spoke in New York and Pennsylvania. National recognition came by 1851. Unlike Barton, Stone married Henry Blackwell after a two-year courtship. Blackwell became Stone’s manager and took the unusual step of a prenuptialagreement stating the couple were partners, would share costs of maintaining a household equally, and allowing Stone to keep her last name. Blackwell went so far as to include a protest of man’s superiority over his wife and vowed not to do so. The Worcester (Massachusetts) Spy published the protest and made national headlines. Stone would bear one daughter, Alice, born in 1857, who went on to follow in her mother’s footsteps. During the 1850s and 1860s, Stone founded or helped found several national organizations beginning with the National Women’s Rights Convention in 1855, and including the Women’s National Loyal League in 1863, the American Equal Rights Association in 1866 along with Lucretia Mott, Elizabeth Cady Stanton, Susan B. Anthony, Frederick Douglass and others. She founded the American Woman Suffrage Association in 1869 with Julia Ward Howe in a split from Stanton and Anthony’s National Women Suffrage Association who only allowed women members. The two Associations would merge in 1887. Stone spent much of her career writing and lobbying for state and national petitions to support her cause. She spoke to Congress in 1891 regarding women’s suffrage although women’s suffrage would remain undone until 1920. Stone also founded and edited the Woman’s Journal in 1870, which ceased publication in 1831. She also led a unaccepted movement to change women’s clothing, sporting a “bloomers” dress at public appearances early in her speaking career. 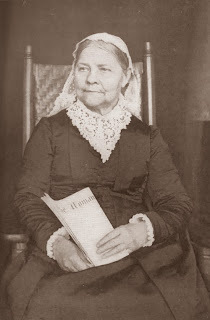 Lucy Stone died at her home in Dorchester, Massachusetts on October 18, 1893.